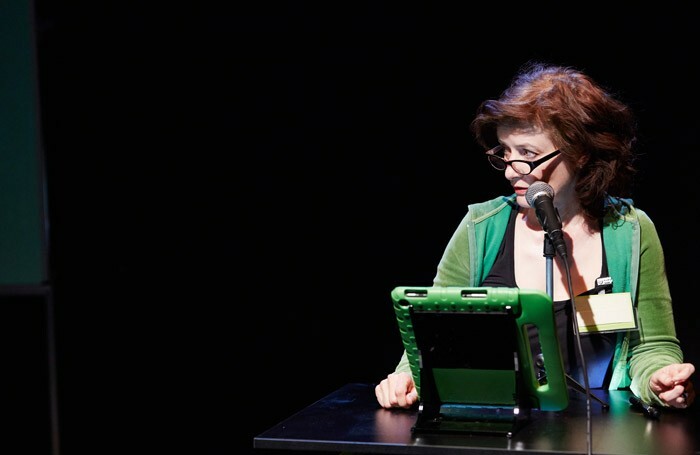 Angela Clerkin in Remote at Camden People's Theatre, London. Remote offers its audience “freedom through choice”. Think Facebook, Uber and Amazon rolled into one. Designed “to help you be more like people like you”, it’s a theatrical choose-your-own-adventure story, two years in the making. In terms of format Remote is about as traditional as it gets with game-makers Coney – the audience is seated in rows and there are performers in role. While the show contains amore than a few interactive moments, there is no requirement for everyone to speak up. Choices in the narrative are made by raising a card. The majority’s preference carries – at the beginning of the show at least, the audience is all in this together. Making decision after decision is exhausting though, no matter the stakes, and it’s a challenge to inject pace and drive into proceedings. A few times it feels like ideas are shown rather than interrogated, and the ending that the audience arrives on this occasion feels tentative – it’s all suspiciously light and calm. But then, it’s supposed to be a fable told by an algorithm to reassure unpredictable humans. No wonder everything turns out fine and dandy. Full of jokes and science fiction tropes, Remote is clever and intriguing – it’s fascinating to see what happens when your suggestions are incorporated into the piece and just as telling when your choice loses – a minority opinion silenced.